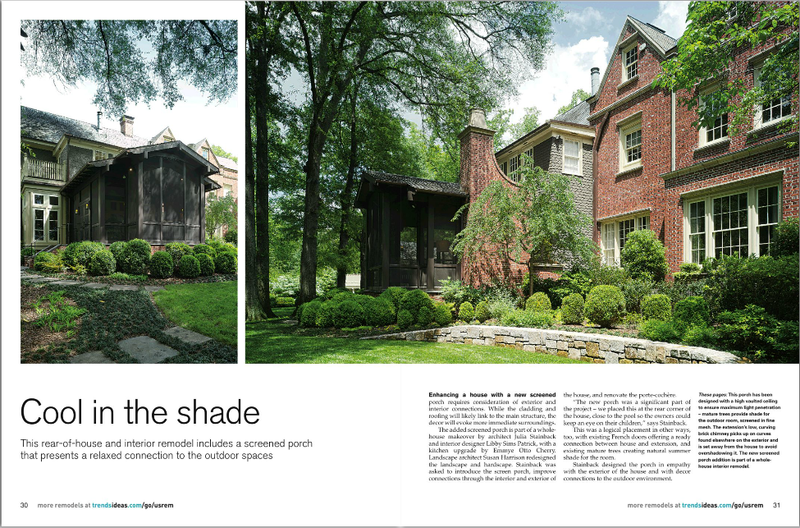 This article in Trends magazine featured one of Sims Patrick Studio's early projects: a beautiful home remodel. We stumbled upon the magazine article recently and wanted to share it. This rear-of-house and interior remodel includes a screened porch that presents a relaxed connection to the outdoor spaces. 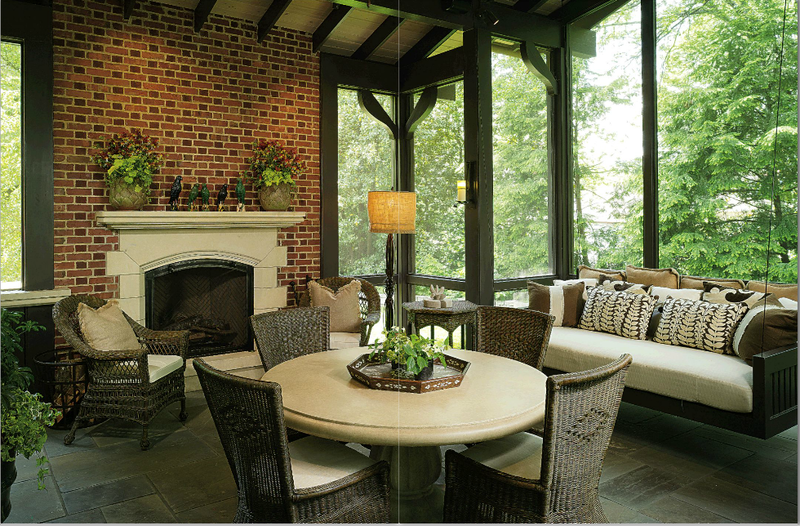 This porch has been designed with a high-vaulted ceiling to ensure maximum light penetration. Mature trees provide shade for the outdoor room, screened in fine mesh. The extension's low, curving brick chimney picks up on curves found elsewhere on the exterior and is set away from the house to avoid overshadowing it. The new screened porch addition is part of a whole-house interior remodel. The screened porch continues the informality of the family rooms, while connecting more closely to natural outdoor elements. Bluestone floors provide low-maintenance surfaces. The outdoor room is not air conditioned. Cool breezes blowing through the finely meshed windows in summer and in winter a roaring fireplace ensure comfortable living temperatures. Left: The family room, breakfast area and kitchen all feature durable materials and vibrant color highlights. A woven light fitting and wooden table with bench seating contribute to the more casual aesthetic. 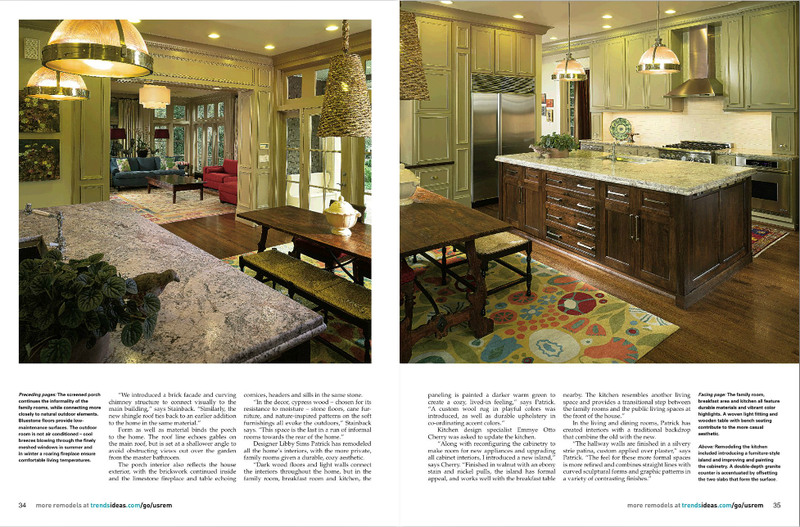 Right: Remodeling the kitchen included introducing a furniture-style island and improving and painting the cabinetry. A double-depth granite counter is accentuated by offsetting the two slabs that form the surface. 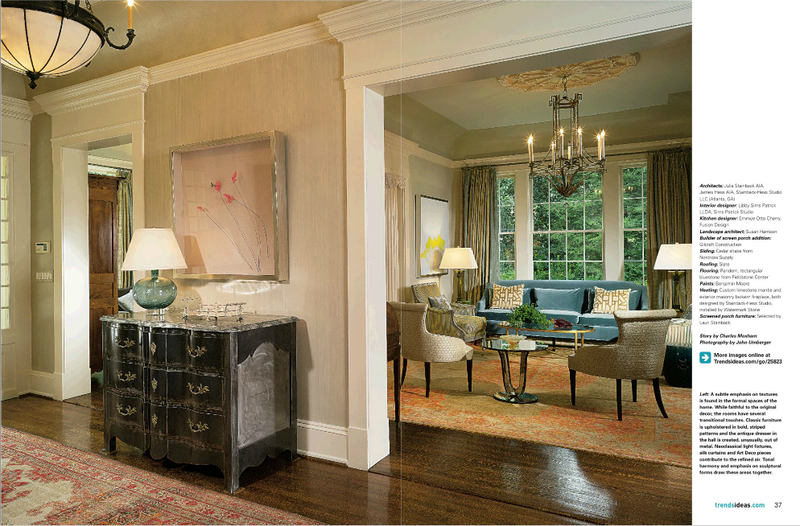 A subtle emphasis on textures is found in the formal spaces of the home. While faithful to the original decor, the rooms have several transitional touches. Classic furniture is upholstered in bold, striped patterns and the antique dresser in the hall is created, unusually, out of metal. 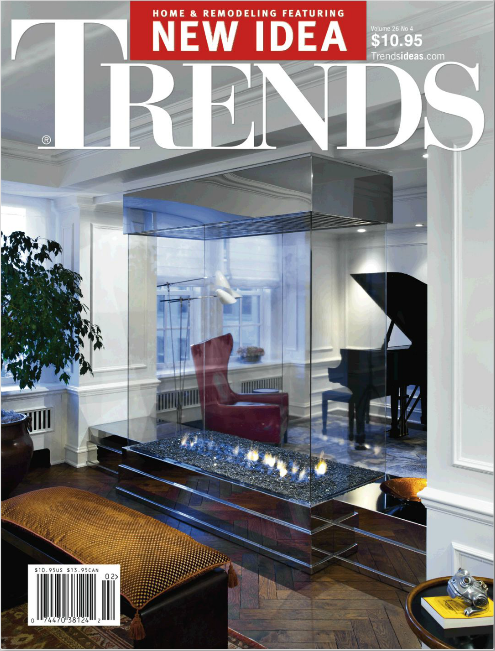 Neoclassical light fixtures, silk curtains and Art Deco pieces contribute to the refined air. Tonal harmony and emphasis on sculptural forms draw these areas together.